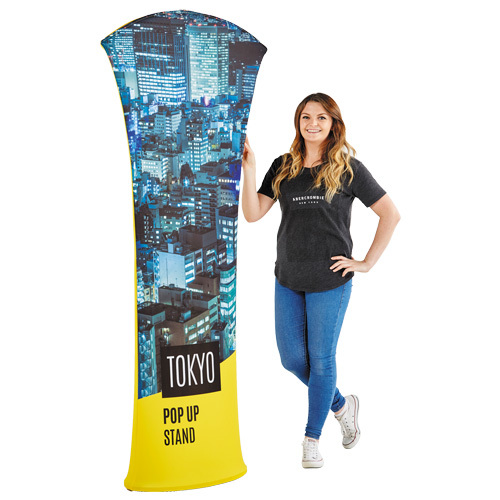 THESE ARE NOT YOUR USUAL POP-UP BANNERS!! 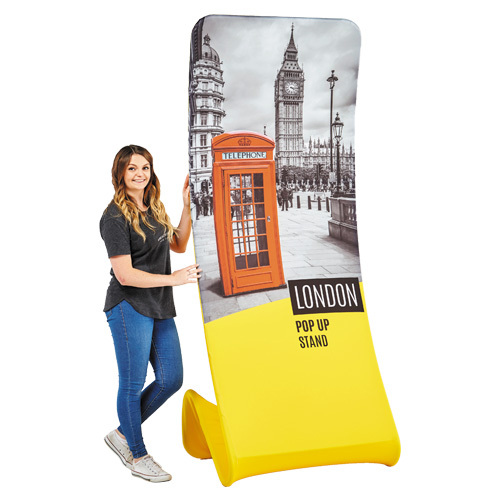 Help your Business really STAND OUT with these fab, fabric stands. 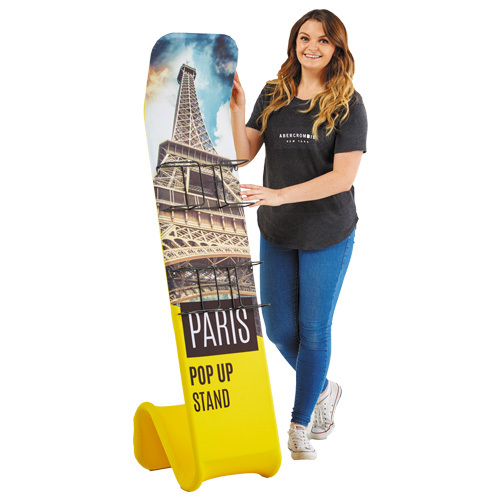 Our fabric display Stands are made up of two main components — a strong, lightweight, tubular aluminium frame and a printed fabric cover. The 260gsm ‘stretch’ fabric cover is printed on the front and reverse as standard. 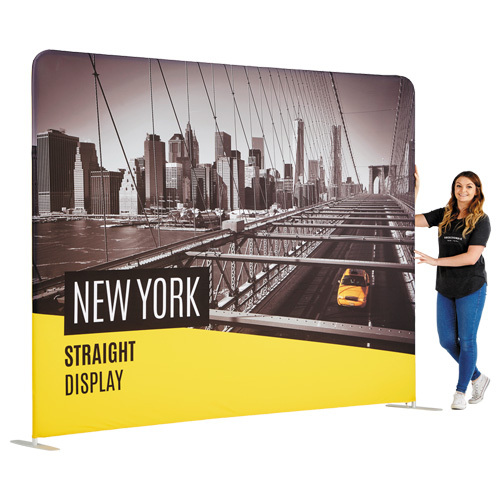 They are designed to fit snugly over the frame and secured at one edge with a zip fastening. 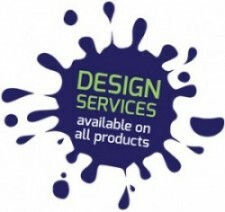 All prices exclude vat, but do include delivery to 1 mainland UK address. It’s not a leaflet. Big, bold designs are the most effective. Text should be as large as possible to ensure it is readable from a distance. For ‘small print’ you should not go below 24pt for dark text on a light background, and 48pt for reversed out text. Respect the ‘Quiet Zone’ (blue shaded area below). Fabric stretches and shrinks (different amounts in different directions) during the production process so there is less accuracy compared to paper. The templates may appear unusually large or proportioned. This is to allow for the stretch/shrinkage of the material. For best results, keep all important elements such as text and logos well within the quiet zone areas but bleed background images/colours to the page edge. Do not try to match up designs from the front to the reverse. The trim guide on the template shows roughly where the fabric will be cut. Please bleed your artwork to the page edge. Finishing fabric displays is a manual process of cutting and stitching, therefore additional bleed is required. For raw fabric add 50mm bleed to each edge of the finished size you require. 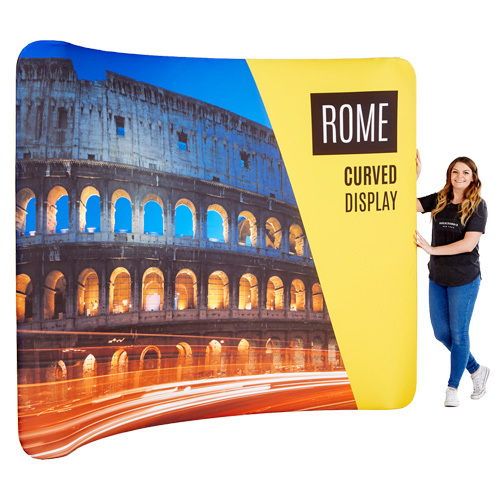 Example below is a PDF of a Rome Fabric Display Stand. The blue area shows the ‘Quiet Zone’ and the purple lines indicate the trim lines.